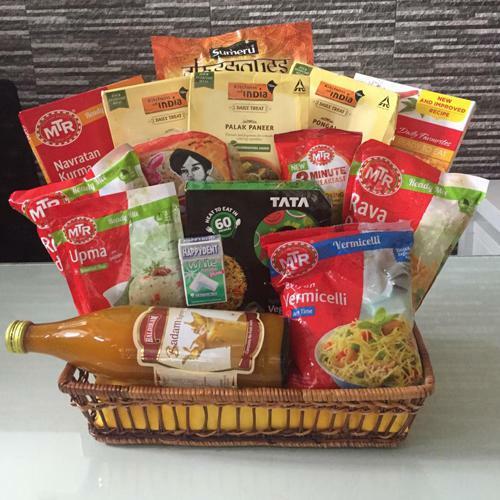 Merge your love with this Humble Everyday Indian Dinner Gift Hamper and send it to your dearest ones. This Hamper is filled with an elegant assortment of award winning treats namely MTR Vermicelli Mix, Sumeru Classiques- Flaky Paratha (Multi Layered) (4 Pcs. Pouch), MTR Ready To Eat- Jeera Rice (250 Grams Carton), MTR Ready To Eat- Palak Paneer (300 Grams Carton), MTR Idli Mix, MTR Dosa Mix, MTR Sambhar Rice Mix, MTR Pongal Mix, MTR Upma Mix, MTR Kesar Suji Halwa, MTR Ready To Eat- Mixed Vegetable Curry (300 Grams Carton), Aashirvaad Ready Meals- Rajma Masala (285 Grams Carton), Haldiram Badam Syrup, Lijjat Papad- Punjabi Masala (200 Grams Pouch) and Happy-dent Chewing Gum.